Jenny and the Day Dreams Travel team came to Cosmic in need of a new, refreshing website. As they were currently using a HTML website, making updates wasn’t a simple process, and the scope for further development and implementation of modern website techniques wasn’t available easily. For these reasons, Day Dreams Travel opted for a modern content management system, which uses mobile responsive templates to enable smartphone and tablet viewers to view the website at optimum viewing. 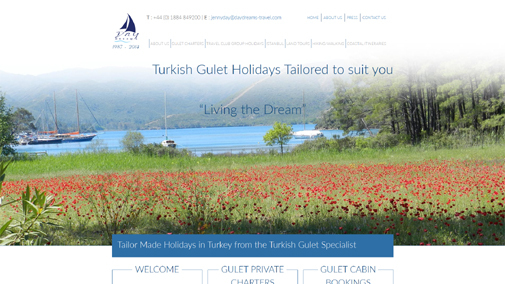 Jenny is a keen photographer, so her photographs are used throughout the website to their full potential, catching the eye of the reader and giving them a taste of what to expect on their gulet holiday in Turkey. Each boat comes with its own profile, featuring a picture gallery, general description of its offerings and technical details. The team has the ability to post the latest news about what they are up to at any given moment, as well as displaying their testimonials to show the great work they do.